The great gray owls in and around Yosemite National Park have been found to be a distinct subspecies. Researchers captured 29 of the large owls in the Sierra Nevada, (they have five-foot wingspans) and took blood samples. Captured owls were held bare-handed and the owls were hooded to reduce stress. Also blood samples from owls in Canada and southern Oregon were collected. Analysis of blood samples using computers showed genetic codes differed enough the Sierra Nevada owls are distinct species. Scientists estimated the Sierra Nevada population has not interbred with the nothern populations for 26,700 years. Behavior differences such as nest site selection, migration patterns, and prey preferences were also observed. Lead researchers on the project were John J. Keane of the U.S. Forest Service Pacific Southwest Research Station, and Holly B. Ernest and Joshua M. Hull of the Veterinary Genetics Laboratory at UC Davis. They suggested naming the Yosemite area great gray owls Strix nebulosa yosemitensis. 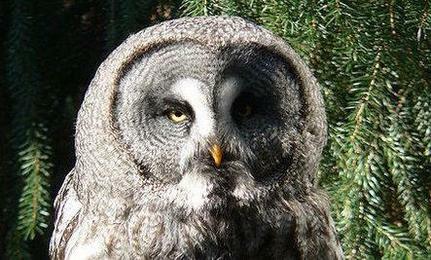 The great gray owl species is named Strix nebulosa. In California great gray owls are listed by the state as an endangered species. There are just 150 of them within Yosemite National Park. When it is breeding season for the owls in the park, no construction work is allowed near their nests, because it can disturb them and interfere with their nesting. The total number of animal species in Yosemite is about 400. It is one of the most popular national parks with about 4 million visitors per year. The park will be 120 years old on October 1st.